Our Sharp leather notebook covers hold a 6 1/2" x 9 1/2" notebook (included) and feature a pocket for 3x5 index cards, also included. Shown above in chestnut leather. All of our full-sized Portfolio Designs are available in this smaller notebook version. Colors available for custom leather notebooks are russet, brown, chestnut or black. Add your business logo, initials, brand or personalize your leather notebook with your name. 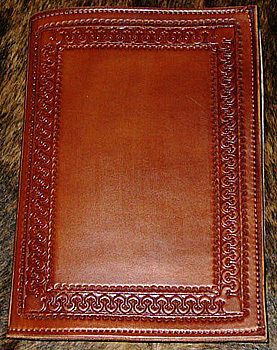 Custom leather notebooks are $95. each. Special Order only, please inquire.